The US Beveridge Curve has undergone a full cycle, with the job openings rate now matching the highest level over the past decade. Yet the return path has been consistently shifted from the trajectory the curve took going into the recession. 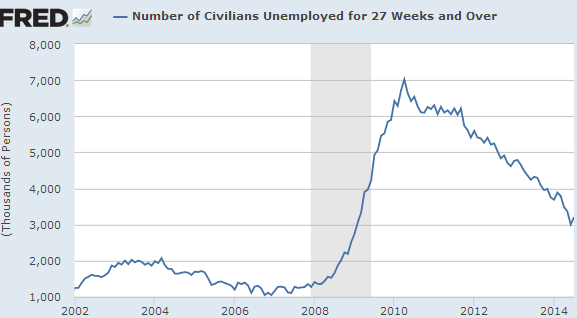 We now have far more unemployed and underemployed workers for the same level of job openings. According to CIBC, if this Beveridge Curve gap were to close (the pre-recession and the post-recession paths converged), the unemployment rate would drop to 5.7%. It means that the US already has the jobs to bring the unemployment rate close to the FOMC's long-term forecast but many of those openings remain unfilled. In labor markets the concept of taking "more strength to undo the existing magnetism before the piece changes polarity" is equivalent to requiring more job openings than in the past to return the same number of people to work as was lost during the recession. The Beveridge Curve downward path has created a tremendous number of long-term unemployed and the nation is having a tough time reabsorbing them back into the workforce - even as job openings improve sharply. Part of the reason is that companies and even government agencies are uneasy about hiring someone who has been out of work for too long even when there is a significant need to add more employees. Furthermore, many of those in the chart above lack the skills that employers are now looking for (or their skills are viewed to have "gone stale"). In contrast, short-term unemployment levels are now around pre-recession lows. that hasn't been properly seasonally adjusted. What we want to watch closely going forward is whether the Beveridge Curve gap begins to close (the top of the hysteresis curve), which would be a possible sign of long-term unemployed workers' "reabsorption". For now however, the skills gap is keeping many without work or out of the labor force altogether.